One of the nicest feelings as a wedding photographer is driving to a brides house in a village you’ve photographed in two or three times, for a family you’ve photographed for before, meeting people you’ve met at a few weddings. knowing the day is going to be one spent with people who make your job all the more enjoyable. So as I drove to Orla and Mark’s wedding in beautiful Ballynoe in East Cork, heading on to The Park Hotel Dungarvan later, I just knew I was going to have a good day. 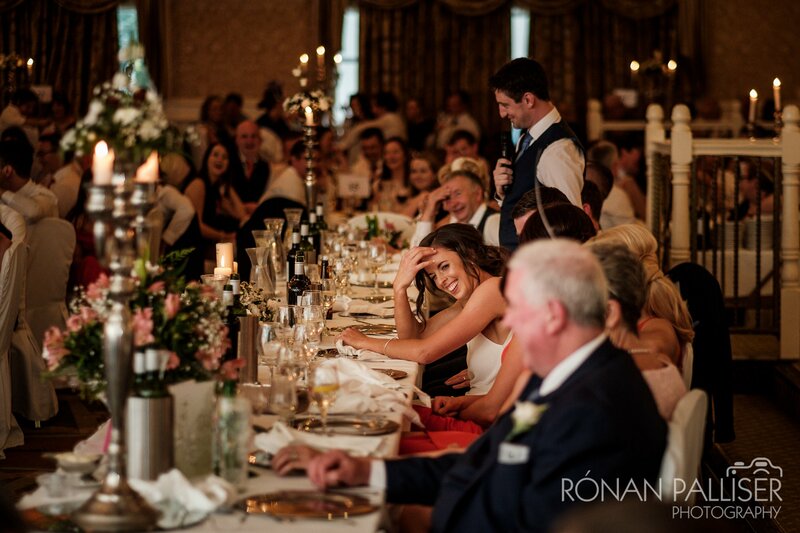 This was also a memorable wedding for another reason – Orla is a six-time All Ireland Camogie medal winner (from 2006 to 2017) and a five time All Star. In other words, sporting gold. And the wedding was a who’s who of the Cork Camogie scene – a press photographer even showed up to get a photo for the Sports section! So, without a doubt, I was in the presence of sporting legends. That, being honest, wasn’t my highlight though. No, my highlight was the absolutely epic lego table plan that I literally wanted to take home with me! A genius idea and one that any future brides or grooms should definitely steal! Orla and Mark were like a lot of my couples – not a fan of spending lots of time in front of the camera, and much more keen on spending it with guests. So while we did stop at beautiful Lismore Castle for photos in the gardens, it really was the briefest of visits. And most of my day was spent capturing candid images of everything that happened around the bride and groom. I tried a night time shot with a difference for this one, taking inspiration from a silhouette they had on their mass scroll to recreate the shot with the full bridal party after dinner – a shot that, funnily enough – required quite a bit of lighting on my part. It was worth it though. As I drove back to Dublin after the wedding I was treated to an epic 3 hour thunderstorm off to the East for the entire journey. It was a memorable end to a memorable day.